Here at President Lincoln’s Cottage we spend a lot of time both on our tours and in our exhibits dealing with Lincoln’s views on slavery and race. However, what gets much less attention in Lincoln studies are Lincoln’s views and actions in relation to Native Americans. 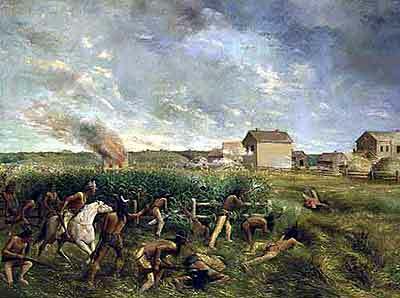 As with slavery, his attitudes towards Native Americans were complicated and have to be approached with two different mindsets: one, our modern understanding of the unfair and often cruel treatment of Native Americans by white settlers and the U.S. government; and the other, the perspective of those 19th century settlers and government officials. As president, Lincoln had to deal with the prejudices of his contemporaries and was himself influenced by the attitudes of his time. One way of examining Lincoln’s views on Native Americans is by looking at one of the biggest crises in his presidency that involved Native Americans, the Dakota Conflict in Minnesota. Lincoln took a stance at the end of the Conflict that is still controversial, particularly in Minnesota, today. The Dakota Conflict of 1862 came about through a series of complicated events that go back to the beginning of white settlement of what we now call Minnesota. In the 1840s and 1850s European settlement of the Minnesota territory began. At this time most of the territory was home to several Native American tribes, including the Dakota . Over time, the United States government, in order to allow for the further settlement of the area, made several treaties with the Dakota. The terms of the treaties were fairly straightforward: the Dakota gave up land in southern Minnesota, and, in exchange, the US made a yearly payment of gold. Many of the Dakota were upset with these treaties, in part because the loss of their traditional lands undermined the Dakota’s natural nomadic existence. But the treaties were even more problematic because the treaty payments often were not given directly to the members of the tribe, but instead wound up in the pockets of Indian agents and traders. These tensions between the whites and the Dakota were exacerbated by the outbreak of the American Civil War. The war made it harder for the federal government to deliver its payments of gold on time, a situation that lead to rumors in the summer of 1862 that the Dakota would not get the gold at all that year. The Dakota at this time were on the brink of starvation and any delay in treaty payments threatened their very survival. Moreover, the war itself was perceived by many as having weakened the United States government, especially the army. The news of the various Union defeats in 1862 led some Dakota to believe that the white settlers were vulnerable to attack. All of this tension and anger exploded on August 17, 1862, the same day that the long-delayed gold actually left Saint Paul for the reservations, too late for either the Native Americans or the newer Americans living side by side in the region. A spontaneous act of violence by four young Dakota men resulted in the deaths of several settlers, and once those deaths occurred, many of the Dakota along the Minnesota River valley quickly became caught up in a war against the settlers and the U.S. government. The following six weeks saw the unfolding of one of the largest Indian wars in American history, at the end of which over 350 white settlers and soldiers were killed and over 1500 Dakota people were captured and put on trial. In response to what most of the settlers perceived as unprovoked murderous attacks on innocent people, the U. S. Army indiscriminately rounded up Dakota warriors and imprisoned them in Fort Snelling. The trials of these 1500 Dakota were conducted by a military commission with little regard for the legal rights of the Dakota or for regular rules of legal procedure. For example, the Dakota were not represented by lawyers and the proceedings were conducted in English, giving the Dakota no ability to represent themselves or cross-examine the state’s witnesses. No wonder, then, that 303 people were sentenced to death by the commission. Despite this large number of convictions, many of the surviving settlers called for an even more harsh response from federal authority. President Lincoln, on the other hand, when he learned of the number of condemned people, took a step that outraged many: he requested transcripts of the trials so that he could personally review the evidence. By the time he had combed through these records, he had commuted the sentences of all but 38 of the condemned warriors. Ultimately these 38 Dakota men were hung in the largest mass execution in U.S. history. Among the Dakota people today, this event is remembered with bitterness and, in the minds of some, Lincoln is held accountable. At the time, however, many Minnesota settlers and voters elsewhere viewed Lincoln as forgiving unforgivable violence. Lincoln’s response to the Dakota Conflict shows a president caught between a sense of duty to the citizens of Minnesota whom he was bound to protect and a president deeply committed to the idea of law and order. On the one hand, Lincoln condemned 38 Dakota warriors to die, in part because doing so would prevent mob violence against Native Americans that many expected if all of the 300 original death sentences were reversed. But Lincoln also upheld the execution of 38 specific individuals because of Lincoln’s own sense of justice. Although he recognized the trial’s many glaring violations of civil rights and the principle of due process, he carefully evaluated the cases against all the convicted men using the best legal standard he could apply, given the circumstances. He decided to uphold death sentences only when evidence existed that the prisoners had either raped (2 cases) or killed civilians (36 cases) as opposed to merely participated in a battle. Mr. Anderegg is an Historical Interpreter at President Lincoln’s Cottage. Just stumbled upon your blog looking for something else, and am going to enjoy reading (have an appt, so have to come back to it). We are doing a Lincoln bi-centennial project – building a facsimile of his birth cabin (on my blog) which will be dedicated on Nov 28th. Also, personally, I’m studying a lady I met when I was young. She was born into slavery in 1858, living to be 110. I didn’t plan either of these things. They just sort of happened in my life, which is also something I should write about on my blog. That’s an amazing story. Keep us posted!